Don't become a victim. Let these WordPress Security experts teach you how to protect your site. Join Dre Armeda, Jason Cosper, and Daniel Kanchev for a detailed walkthrough of practical WordPress security. Throughout this session we'll cover what does – and does not – increase the security on your site, how to actively prevent malicious visitors from taking advantage of you, and finally what tools you want to have ready in order to survive and recover from an attack. 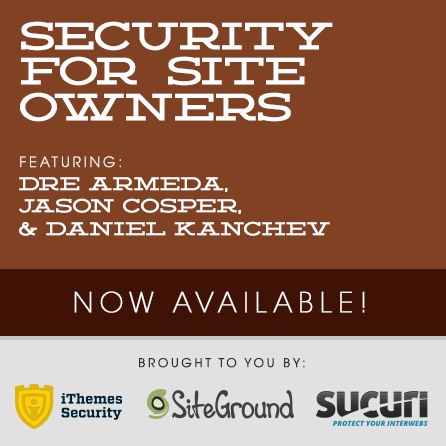 On Saturday, May 17, Dre Armeda, Jason Cosper, and Daniel Kanchev will teach you about the many ways and reasons an attacker may attack your site. Specifically, we’ll discuss what does, and does not work to improve your site’s security, how you can prevent malicious visitors from even accessing your site, and, ultimately, how to recover after an attack. Hope is not a strategy. Learn from the experts and increase your site security. This session will be broadcast live on May 17, starting at 1pm ET. There is a lot of bad advice on the internet for making your site secure. Let Dre debunk all the myths and cut right to the heart of what it takes to actually improve your site security. We’ll review actionable steps you can take right now, tools that may be helpful, and how to better navigate between security fact and fiction. Tired of comment spam? How about contact form spam? How about the visitors you’re getting who are actively trying to damage, deface, or overrun your site? Jason has tools to prevent and protect against all of this, and more. This is the ultimate disaster recovery plan. Daniel will show off his workflow for responding to a site attack – who to contact, what to recover, how to recover. An attack can happen to anyone, and especially you. Particularly if you’re ignorant to how attacks work and how to recover from them. Dre is the Co-Founder of Sucuri Security. Dre is a Harley enthusiast, and a Chargers fan. he wears many hats, and love tacos. He is infatuated with WordPress, web design, and web security. Dre is also the Co-Host of the DradCast on Wednesday nights. Pressing all the words! Jason works for WPEngine and helps customers with security concerns on a daily basis. You may also know him from such sensational work as Hipster Ipsum or his conservative and informative basketball tweets. Most likely, though, you know him for being a WordPress expert who spends his days shilling great plugins and general WordPress advice. Daniel is a senior web apps engineer at SiteGround web hosting company. Passionate for all things open source, WordPress, new server technologies, security and speed, he has helped for the various in-house security and performance boost solutions to make WordPress websites more secure and faster. When he’s not working on patching WordPress vulnerabilities or cleaning hacked websites, you can see him practicing extreme and not so secure sports while traveling the world.